, a very Celebrated protestant missionary, was born at Pulnitz in Upper Lusatia, June 14, 1683. He began his education in the college of Camentz, where he first appears to have cherished that pious zeal which influenced his future conduct and labours. He then removed to Goerlitz, afterwards to Berlin, and lastly to Halle, where he studied divinity; but his excessive application to this and other learned pursuits injured his health and brought on a species of melancholy, to divert which he was advised to travel. He happened to visit Berlin in 1705, when missionaries were wanted by the king of Denmark to go to the East Indies, and resolving to be one of the number, he was recommended to Dr. Lut kens, whom his Danish majesty had employed to find out men of learning, zeal, and piety, suited to the work. 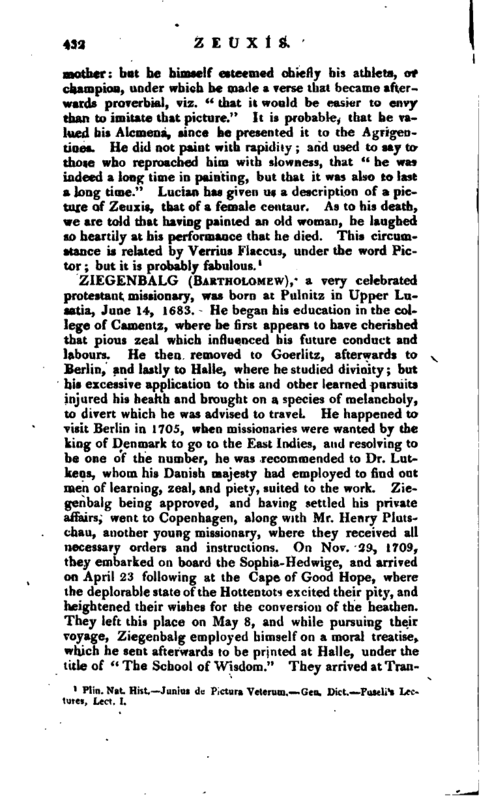 Ziegenbalg being approved, and having settled his private affairs, went to Copenhagen, along with Mr. Henry Pluts­^hau, another young missionary, where they received all necessary orders and instructions. On Nov. 29, 1709, they embarked on board the Sophia-Hedwige, and arrived on April 23 following at the Cape of Good Hope, where the deplorable state of the Hottentots excited their pity, and heightened their wishes for the conversion of the heathen. 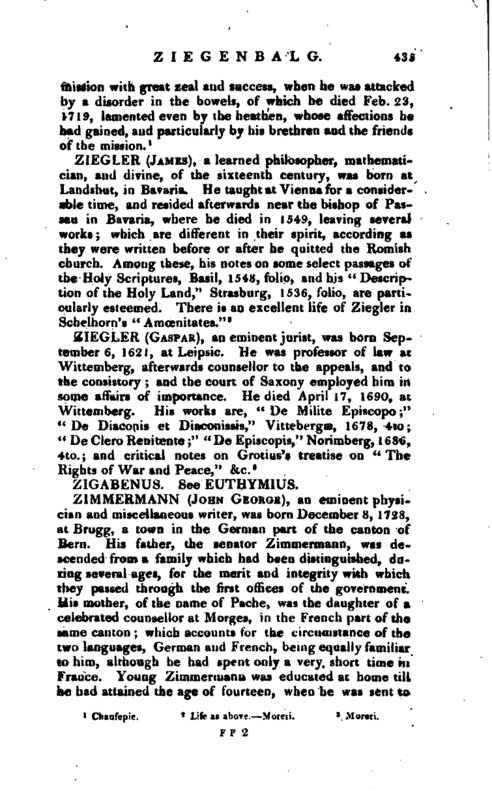 They left this place on May 8, and while pursuing their voyage, Ziegenbalg employed himself on a moral treatise, which he sent afterwards to be printed at Halle, under the title of “The School of Wisdom.” They arrived at | Tranquebar on July 9, but found their enterprise obstructed, by many difficulties, one of which was their ignorarrce of the languages spoken‘ in the country. 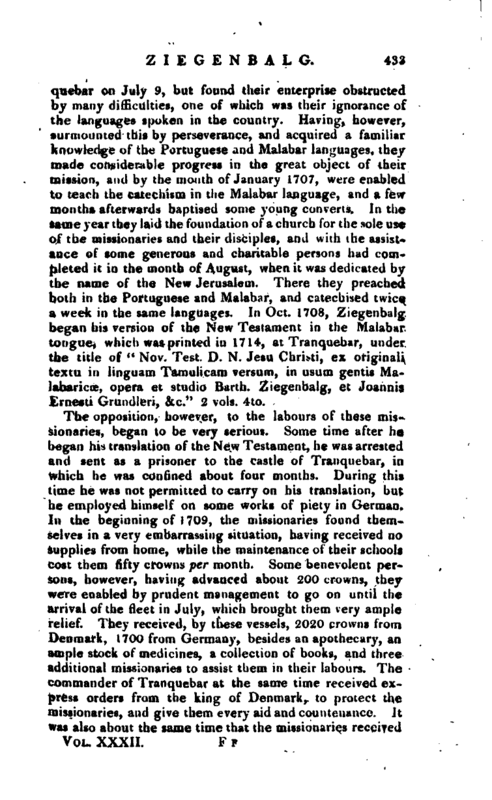 Having, however, surmounted this by perseverance, and acquired a familiar knowledge of the Portuguese and Malabar languages, they made considerable progress in the great object of their mission, and by the month of January 1707, were enabled to teach the catechism in the Malabar language, and a few months afterwards baptised some young converts. In the same year they laid the foundation of a church for the sole use of the missionaries and their disciples, and with the assistance of some generous and charitable persons had completed it in the month of August, when it was dedicated by the name of the New Jerusalem. There they preached both in the Portuguese and Malabar, and catechised twice a week in the same languages. 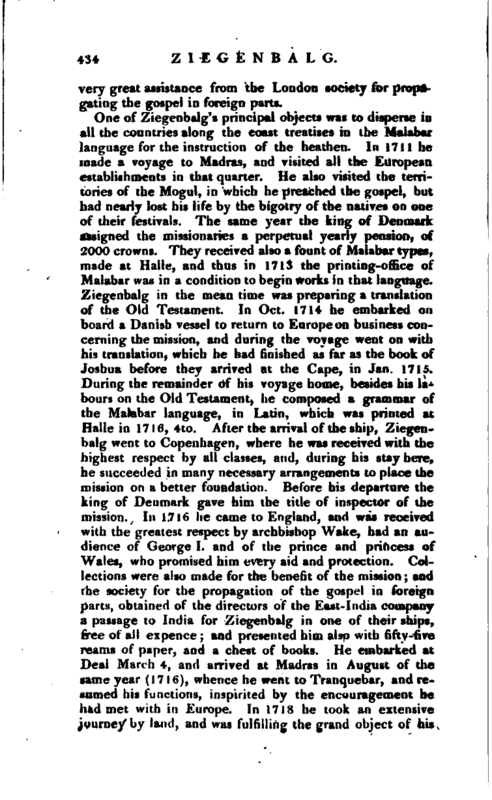 In Oct. 1708, Ziegenbal^; began his version of the New Testament in the Malabar tongue, which was printed in 1714, at Tranquebar, under the title of “Nov. Test. D. N. Jesu Christi, ex originali textu in linguam Tamulicam versum^ in usum gentis Malabaricce, opera et studio Barth. Ziegenbalg, et Joannis Ernesti Grundleri, &c.” <2 vols. 4to. The opposition, however, to the labours of these missionaries, began to be very serious. Some time after he began his translation of the New Testament, he was arrested and sent as a prisoner to the castle of Tranquebar, in which he was confined about four months. During this time he was not permitted to carry on his translation, but he employed himself on some works of piety in German. In the beginning of 1709, the missionaries found themselves in a very embarrassing situation, having received no supplies from home, while the maintenance of their schools cost them fifty crowns per month. Some benevolent persons, however, having advanced about 200 crowns, they were enabled by prudent management to go on until the arrival of the fleet in July, which brought them very ample relief. They received, by these vessels, 2020 crowns from Denmark, 1700 from Germany, besides an apothecary, an ample stock of medicines, a collection of books, and three additional missionaries to assist them in their labours. The commander of Tranquebar at the same time received express orders from the king of Denmark, to protect the missionaries, and give them every aid and countenance. It was also about the same time that the missionaries received | very great assistance from the London society for gating the gospel in fdreign parts.